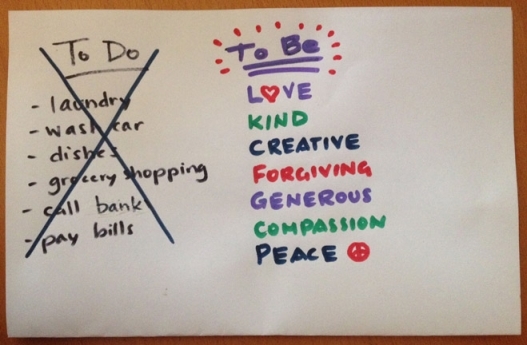 What is on your "To Be" list? I was reading Dave Ramsey the other day and I came across this article about not focusing so much on our to-do lists but more on our to-be list! It feels good to finish the items on our to-do lists, but what about spending some time on who we are and how we move about in the world. If I ask a friend how I am doing, what would they say? What are my gifts that I can share? What makes me feel like I am serving a greater purpose? Am I the parent/daughter/sister/spouse/coworker/friend/neighbor I want to be? What traits do I see in others that I want to mirror? How can I make my family and friends feel more loved and supported? Being who you want to be is harder than just getting stuff done. Don't get me wrong, getting stuff done is great, but how it is done, counts for so much. I used to stress about the house before anyone came over. I stressed out Pedar and the kids. I ran around yelling,"Put that away, help me, am I the only person that cleans around here! AHHHH!!" I don't want to be that stressed out, don't-enjoy-company-kind of person. I wanted to be the person that is ready for company and relaxed and is able to enjoy the time shared. After a lot of time and effort, a lot of Flylady and getting rid of clutter so I didn't have to clean and re-clean over and over, I am now the relaxed person I want to be. I was able to enjoy opening my home and pool this weekend for one of Casey's friends birthday parties. I love getting to know our kids friends and parents. I want the kids to have happy memories at our house. I want to be stronger. I want to be healthier. I want to be a meditator! I want to be a good friend. I want to be a good sister and daughter and aunt. I want to be more playful and sing and dance more. I want to be more giving of my time and talents to help others. I want to be focused on helping my kids with their goals and developing their gifts. I want to be a traveler. I want to be a life learner. I want to be more romantic with my super-hunky-hubby. I want to be known for smiling and laughing. I want to be really great at sticking with a budget. I want to be a loving Mom.